Hydrostatic Transmissions and Actuators takes a pedagogical approach and begins with an overview of the subject, providing basic definitions and introducing fundamental concepts. Hydrostatic transmissions and hydrostatic actuators are then examined in more detail with coverage of pumps and motors, hydrostatic solutions to single-rod actuators, energy management and efficiency and dynamic response. Consideration is also given to current and emerging applications of hydrostatic transmissions and actuators in automobiles, mobile equipment, wind turbines, wave energy harvesting and airplanes. End of chapter exercises and real world industrial examples are included throughout and a companion website hosting a solution manual is also available. 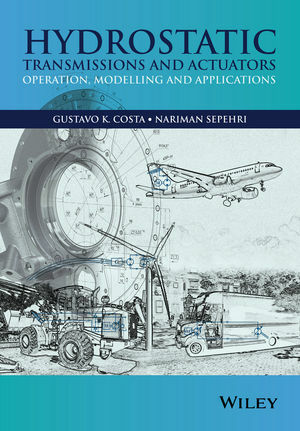 Hydrostatic Transmissions and Actuators is an up to date and comprehensive textbook suitable for courses on fluid power systems and technology, and mechatronics systems design. Gustavo Koury Costa graduated in 1992 with a bachelor degree in Mechanical Engineering and has been teaching Fluid Power for 19 years at his current institution. He also holds a Doctorate degree in Computational Fluid Dynamics, having spent one year as a Postdoctoral Fellow at the University of Manitoba Fluid Power and Tele-Robotics Research Laboratory. Nariman Sepehri is a professor in Mechanical Engineering. He holds five patents and has published over 100 journal articles on various aspects of fluid power, including systems, manipulation, diagnosis and control. His current research focuses on self-healing, energy-efficient and reliable fluid power systems with applications to aircraft, hydraulic tele-manipulators and off-highway equipment. He is a Fellow and has served as Chair of the Fluid Power Systems and Technology Division of the American Society of Mechanical Engineers (ASME). He has served on editorial boards of eight journals including the International Journal of Fluid Power.